Cut out paper angels and write or draw prayers on them and send the to the person you are praying for. 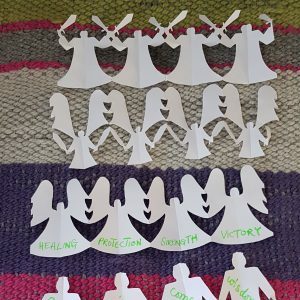 I love the idea of creating paper angels as a symbol of our prayers and of God sending His angels to help the person we are praying for. Some people believe angels have specific roles, and the Bible seems to suggest this, with Gabriel being a messenger and Michael, being a guardian angel. You might like to think about the different roles or types of angels the person you are praying for might need, such as healing, protection, comfort, wisdom and so on. The Bible isn’t clear what angels look like, but rather that most people find them rather scary! You might have your own ideas on what they look like, and so could create your angels to look like that. We created some different ones, some with and some without wings (which can be controversial! ), some with swords. What will yours look like? What might they be holding? You might like to look at some of the Bible verses to inspire you. Here are some ideas: Daniel 10, Luke 1:8-22, Genesis 16, Genesis 28. To cut out your angels, place an A4 sheet of paper in portrait (long edges on the sides) and fold it in half from top to bottom, creating two long strips of paper. Fold each strip of paper in half longways, then twice more. Unfold it and use the folds to create concertina folds. Your first folds will give you four paper angels with no wasted paper. Next draw HALF angel onto the top fold of paper, making sure the half-a-head is on the fold, not the edge. Cut it out carefully. It’s often easiest to do all the cuts from the edge in rather than trying to follow the lines by turning the scissors. Then carefully unfold your paper and … Tah-Dah! Paper angels. Time to write prayers, angel names, draw clothes or patterns then send or give them to the person you are praying for. If you want to make a whole line of angels, you can cut out multiple strips. You can use glue to stick half an angel from one strip to half of one from the next to make a long line. This works best if you make lots of strips with the same shape angels. If you want larger angels, try using A3 or even A2 paper! If you are serious about creating angel bunting, you could perhaps even make cloth bunting in the shape of angels! When you are sending your angels to the person you are praying for, you might like to pop in a note to say you are praying for them, and that the angels are a symbol of your prayers and the presence of God and angels around them where they are. Sometimes when the Bible talks about angels, it uses the term ‘the angel of the Lord’ and then later just refers to ‘the Lord’. I’m not sure what this means. Could it mean that an angel came then God came too? Or that the person mistook the actual presence of God for an angel? Or that when God appears in visible form He comes with angels? Or that God sometimes stays invisible but His angels can be seen? What do you think? All I know is that if people are seeing angels, it’s definitely a sign of God’s presence close to them.